Want to stick out from the crowd and shine a light on your products and services? Backlit graphics utilize LED lights, frames and easily exchangeable fabric overlays to create eye-catching displays for trade shows, events or any business. Also commonly referred to as lightboxes, backlit displays can be utilized indoors or outdoors as long as you are near a power source. Whether you’re advertising your latest products on the street or vying for the attention of foot traffic at the latest trade show, a custom backlit graphic can bring your marketing efforts to the next level. SpeedPro Imaging offers a multitude of options in this area, and our visual communication experts across the nation are ready and willing to help you find the right solution for your needs. We use state-of-the-art printing technology and top-tier materials to create all of our products, including backlit graphics, so you can be sure your custom graphics will look professional and last a long time. If you’re looking for a way to make your graphics more eye-catching, consider adding some illumination. Let’s look at some of the ways you can use backlit graphics and how they work. As we’ll see, backlit graphics come in a variety of forms and can help you market your business in just about any setting. Many businesses participate in trade shows. These events allow you to market your business, either to other businesses or directly to consumers. Trade shows can be extremely beneficial marketing opportunities, but they present some real challenges. For one, you only have about 10 or 20 feet of booth space or, in some cases, just the space of one table to get your message out there. Perhaps an even bigger challenge is that you need your booth to stand out from the many other company booths in the expo hall. Add to all this that you need a display you can transport and set up easily. Typically, the most visually engaging trade show booths include a combination of several display types. For example, you might incorporate a custom printed table covering, standing banners and a large popup display into your booth. Check out our full suite of custom trade show options to see the many types of displays you can use in your trade show booth. No matter what kind of space you have to work with, SpeedPro can help you come up with the perfect suite of graphics to help you make the most out of that space. Several of the display types commonly used for trade shows can be backlit. For example, our popups, which are lightweight kits that display large fabric graphics stretched over a frame, are impactful options. You can display your messages and images in seconds with their easy-to-setup designs, as they require no tools. With the proper illumination, the lights will complement your graphic’s colors and help to create an irresistible venue backdrop. Other fabric display options, such as modular displays, can also come with lighted units and accessories. Backlit graphics are so valuable for trade shows because they can help your booth stand out. Especially if lighting is low, a backlit display will pop from the background and grab people’s attention. Even in a well-lit environment, a backlit graphic appears especially bright and vivid. When you need to stand out from the competition, backlit graphics can give you the edge you need. When you’re launching a new product or product line, you may want to host a party to create a buzz about the new product just before it officially comes out. These events are especially popular for B2C marketing. When you want to show off a new product and get people excited about it, you need creative graphics that show and communicate what this new product is all about. Whether you choose to feature your new product on a popup display, tower or some other type of display, illuminating it is a sure way to make your graphic come to life and get people more excited. Especially if your party takes place in the evening with low lighting, a backlit graphic will glow and command everyone’s attention. Conferences are typically aimed at helping your staff learn and renew their passion for what they do. In some cases, you may host a conference for your employees, and in other cases, you may choose to host or attend a conference that is intended for people in your industry or is aimed at building more widely applicable skills, such as leadership skills. When you have the opportunity to host a conference for your employees or to host a conference for a broader audience, you want to make sure your brand is visible. This is especially true if the goal is to get employees excited about working for your company. Use a conference as an opportunity to immerse them in your company’s branding. As with previous examples, backlit graphics are an excellent choice for making your graphics pop and getting people excited about your company. Community events like fairs and festivals can provide a valuable opportunity for connecting with other local businesses and with consumers. Whether you’re sponsoring an event or renting booth space, you want to make the most of the time and space you have to reach your local community. Of course, face-to-face interaction is an essential way of making connections, but first, you have to get people’s attention. Backlit graphics are likely to make your booth look more interesting and more professional than surrounding booths. Backlit graphics give you the extra boost you need to attract even the people who are hot and tired from a day at the fair. Since many festivals take place outside and end after dark, backlit graphics will also ensure that you can make the most of the entire time rather than only daylight hours. Graphics that are glowing in the dark will certainly stand out. Events are fun and exciting opportunities to show off your brand, but if your business also has a building where you operate on a day-to-day basis, and you should make the most of this space, as well. The nice thing about branding in your office building, retail store or other space is that you can opt for more permanent types of graphics if you want. No matter what types of signage you have at your business, backlighting can be an effective way of making your graphics more vivid and visible to both employees and customers. For example, you can backlight outdoor signs during both day and night hours to make them highly visible to passersby or anyone trying to find your building. You can use backlit fabric signs on the street to attract foot traffic and notify people of a sale or promotion that’s currently going on. Inside, you can replace your plain counter with a backlit counter or incorporate custom contour cut graphics that contain some illumination. You can also use backlighting to make any fabric displays throughout your office more vibrant. For example, you might have standing banners in your reception area that could be lit to attract more attention. Signage is an essential part of any company’s exterior and interior, so there are innumerable ways you can use backlit graphics throughout your business. Especially consider signage that involves fabric on a frame since these displays lend themselves well to being backlit. There are different backlit materials you can choose from, but in most cases, a backlit display consists of fabric stretched over a metal or plastic frame with lights attached to the frame. All you have to do is plug in your lights, and you have an illuminated graphic. Typically, these graphics can be changed in and out easily if you want to use the same frame and lighting to display a different graphic. Graphics are printed onto the fabric using a process called dye sublimation. This means the UV-resistant, long-life inks are pressed into the fabric. Backlit graphics printing is no different than other fabric products that are printed with dye sublimation. The thing that really sets backlit graphics apart is, of course, the backlighting. We use LED lighting to illuminate backlit graphics. LED backlit graphics are a smart choice since LED lights last about 25 times longer and use at least 75 percent less energy than incandescent lighting. Backlit fabric towers: Backlit towers are freestanding. They can be double-, three- or four-sided, and they come in various sizes, all the way up to 12 feet tall. Your graphic is printed on fabric, which is held tightly by the tower’s frame. Lights illuminate all the graphic panels from the inside out. 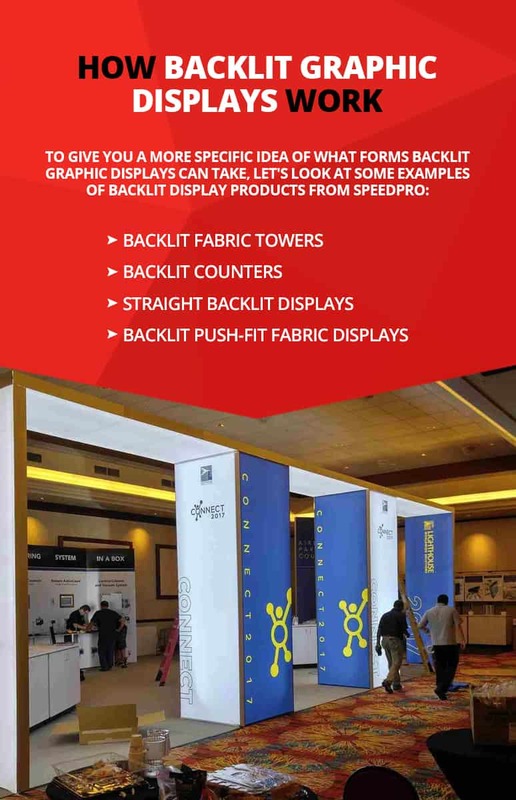 With various shapes and sizes to choose from, fabric towers can create impressive backlit displays that fit in the space you have to work with. In particular, towers take advantage of vertical space, giving you plenty of room on the floor for tables and any other displays. Backlit counters: Backlit counters can provide the perfect centerpiece for an exhibit space or can serve as an eye-catching reception desk. These counters feature sleek designs in a variety of configurations. Choose from a collapsible push-fit tension fabric counter or from options that feature a central push-fit tension fabric display inside a laminate counter. Cabinets in the back allow for easy storage. While fabric is most common, some backlit counters can accommodate a backlit vinyl graphic. Straight backlit displays: Backlit straight tension fabric displays use a rectangular aluminum tube frame equipped with an LED light curtain. This illuminated frame is covered with a printed fabric graphic that can be zipped up like a pillowcase for a tight fit. These displays are easy to set up at any event and can make a huge impact. They come in a variety of sizes, all the way from small, tabletop displays to displays that are 30 feet wide. Backlit push-fit fabric displays: Backlit push-fit fabric displays hold printed fabric in tension over a collapsible display frame. LED lighting attaches to the frame, and the push-fit backlit graphic connects to channel bars around the perimeter of the frame. These fabric graphics can either be single- or double-sided. Choose from varying sizes, including tabletop and full height options. Since the frame is collapsible and requires no tools, setup and take-down are both quick and easy. Another option for backlit displays is to purchase lighting kits that can help you transform your existing displays into backlit displays. Since many types of displays already use frames covered in printed fabric, you may only need the lights to turn an ordinary display into an extraordinary one. Illuminating an existing display can breathe new life into it. No matter what shape or size or where they’re placed, backlit graphics can help you shed light on what makes your company or your products a cut above your competition. For large-format graphics, you want to use designers and printers you can trust. When you partner with SpeedPro Imaging, you can be confident that all graphics we produce for you will be designed with the utmost care and created using the best materials for a finished product you’re proud to display. When you consult with our staff, you’ll experience the way SpeedPro takes a personalized approach to every project we work on. We want to make sure we understand your needs and goals so we can produce a product that fits in your space, fits in your budget and is sure to wow your employees or customers. If you have existing branded displays you want to match, we can use expert color matching to ensure that your new displays fit in seamlessly with your old ones. At any SpeedPro studio you visit, you’ll find the same level of unwavering commitment to quality and customer service. When you want to make a bold impression on potential clients and customers, you don’t want to cut corners with dull displays. These displays may say what you need them to, but they’ll fail to attract people’s attention and show off your creativity and professionalism. Quality backlit displays will share your message in a way that wows. They appear sleek, professional and creative, so they’re sure to attract the right kind of attention. Contact your local studio to schedule your initial consultation with our team and take advantage of our backlit printing services. With new custom backlit graphics, you’ll outshine your competition every time.